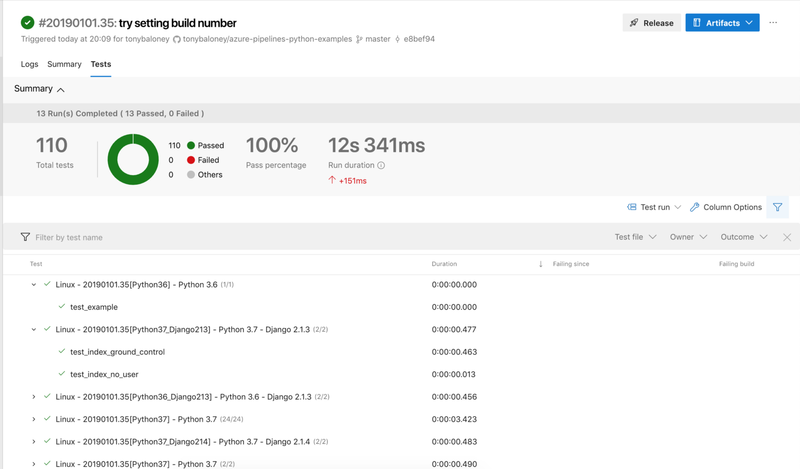 In this tutorial, I’ll show you -by example- how to use Azure Pipelines to automate the testing, validation, and publishing of your Python projects. Azure Pipelines is a cloud service that supports many environments, languages, and tools. It is configured via a master azure-pipelines.yml YAML file within your project. Your project can exist in multiple source repositories, and automated integrations are available for GitHub. If you want to see the project layouts and how the configuration looks, everything in this tutorial is on my GitHub repository. It’s licensed as MIT, so you can do with it as you wish! In these examples, I’ve focused on testing. Because Python is an interpreted language, the build stage is typically replaced with dynamic and static checkers, known as ‘linters’. Having automated tests for any Python project can give you fast notifications when a change to the code has broken an existing feature in your application. Your azure pipelines build will consist of jobs, these jobs consist of a number of steps. Some steps are pre-defined and called “Tasks”, you can find the full list on the Microsoft Azure Pipelines website. You can also define your own tasks consisting of scripts in either Bash (Linux and MacOS) or PowerShell (Windows). PublishTestResults@2 — Publish the test results to the dashboard. Test results should be in the Junit XML format. When configuring a job, you have to pick which Virtual Machine image to use for the job agent to execute your steps. For Linux, there are many images to choose from, Ubuntu 16 has the latest versions of Python available. To test on Windows, the best image to choose is the vs2017-win2016 image, which has Visual Studio 2017 on Windows Server 2016. Because steps are defined in a job, and a job can only have 1 operating system it can get very tedious to copy steps between jobs and keep the up to date. If your build and test steps are the same across Linux and Windows, you can move the steps into a separate file (in this example, called templates/steps.yml) and include it in the job. Once you’ve configured your testing jobs to output a Junit XML file and you’ve successfully configured the PublishTestResults task, you will see a detailed test dashboard. All test failures will be available here. In the examples, I’ve named the Test Results based on the operating system, job name and the version of Python so it’s easier to see what’s happening. You can add any variable or label to the test names. 1. Choose the Python version. This is important as Django can behave very differently between Python versions. This example tests Python 3.6 and 3.7. You can change these for other versions, like 3.5. The installation of Django would be via. pip . This script task updates the pip binary and then installs any dependencies in django-basic/requirements.txt, which is the example Django Project I’ve set up for this tutorial. To test a Django application you can use the python manage.py test command, or use another tool like Pytest. Lastly, use the builtin task to copy the test output to the Azure Pipelines service. Here is the azure-pipelines.yml for the example Django app which can be found on GitHub. If you want to test your Django application against multiple versions of Django, or a particular plugin, you can add extra version numbers as variables in the build matrix. In this example, I’m testing 2 versions of Django across 2 versions of Python. This generates multiple jobs automatically. Because there is no built-in task for selecting the version of Django, we use the variable to control the version installed in pip. This script task adds the django.version variable defined in the matrix to the pip install command. If you’re using the Flask web framework, the steps are very similar to Django, but it doesn’t require a Pytest plugin. In the example repository, I’ve simply copied the Flask example web application which comes with tests. To use this on Azure Pipelines, you need to run the setup.py command using pip install -e . from the application directory. Adding the [test] suffix will install the testing tools. If you wanted to calculate the test coverage of your application, you combine the testing task with the coverage package. For the flask-basic example project, you install both Pytest and coverage, then run pytest through the coverage run command. You will be able to view the coverage data in the Azure Pipelines portal. 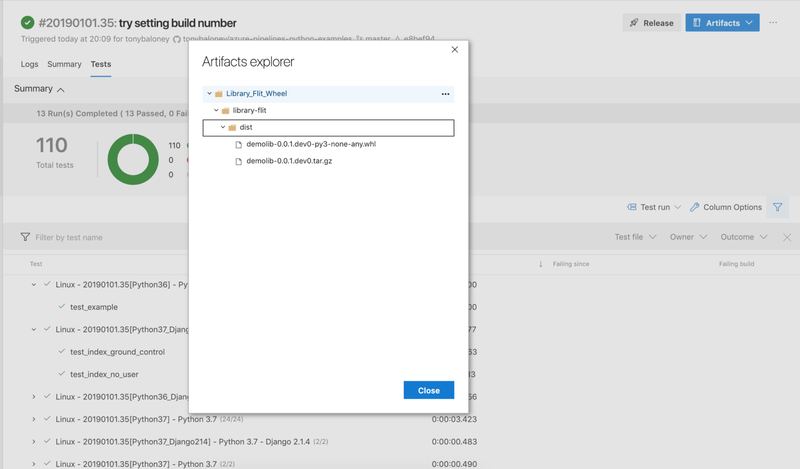 If you’re building Python libraries for distribution via shared files, PyPi or another artifact system, this example illustrates how to build source and binary distributions on Azure Pipelines. Aside from the test commands that have been shown throughout this tutorial, we need to add a couple of extra tasks. Azure Pipelines comes with an artifact publishing, hosting and indexing API that you can use through the tasks. You can also see the artifacts from a build in the web interface. In the example project, I’ve created a really simple Python package, with a setup.py and setuptools configured. To install the dependencies, this time we’ll install the package using pip install -e . once we’ve changed to the source directory. Azure Pipelines has support for publishing the packages to PyPi, but I haven’t added that to my examples. It’s well documented on the website. If you’re using pyproject.toml as your configuration file and using Flit to publish and build packages, there are a few changes to make to the previous example. Run flit install instead of pip install -e .
Each script step will start from the root path, even if the previous step changed directories. Try to avoid using too much bash-scripting in your steps that is specific to Linux, this makes it easier to copy steps for Windows. In PowerShell, many of the commands you would expect in Linux exist, like cd ls mkdir rm .